Surolan Drops There are 2 products. 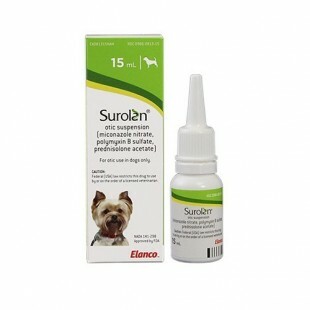 Surolan is used for the topical treatment of otitis externa and skin infections caused by Gram-positive bacteria e.g. Staphylococcus aureus and Streptococcus spp. and Gram-negative bacteria Escherichia coli and Pseudomonas aeruginosa. Surolan is used for the topical treatment of otitis externa and skin infections caused by fungi and yeasts: Trichophyton spp., Microsporum spp., Malassezia pachydermatis, Candida spp. Surolan Drops are used for the topical treatment of otitis externa caused by the ear mite Otodectes cynotis. Surolan also has anti-inflammatory and anti-pruritic activity. Surolan is for topical administration. Shake the bottle of Surolan well and ensure the product is fully resuspended before use. At the beginning of treatment, hair surrounding or covering the lesions must be clipped; this should be repeated during treatment with Surolan if necessary.